Boarded up store in Rockaway, Queens, NY. Photo by Shannon Stapleton, Reuters (part of slideshow). 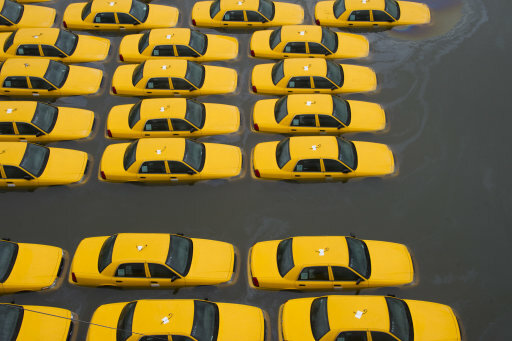 A taxi parking lot in Hoboken, NJ. When the scale of the failures during Hurricane Katrina became evident, one of the most persistent right-wing talking points was that the city of New Orleans had unused school buses that it allowed sit in a lot and get flooded when they could have been used for an evacuation. The argument never, er, held water, but it circulated nonetheless. The above illustrates the scale of the problem. If a private company standing to lose hundreds of thousands of dollars in flood damage and lost revenues couldn't organize getting its cars out of a lot ahead of a flood, how was a city supposed to mount a massive evacuation of hundreds of thousands of disadvantaged people, with a storm that got much less advance billing than Sandy? 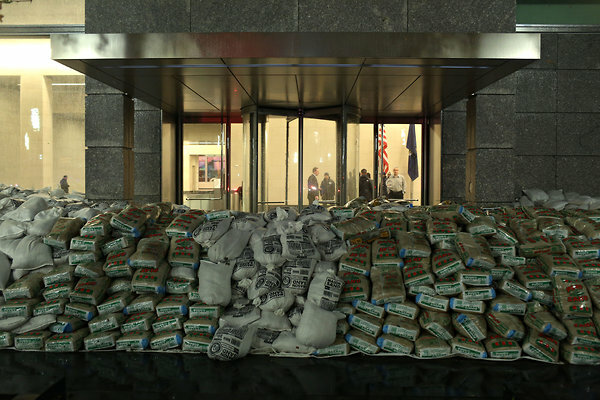 Outside the Goldman Sachs HQ in Lower Manhattan (photo: New York Times). New York Times on the US East Coast storms -- The full moon on Monday could cause even greater flooding because tides would be at their peak. 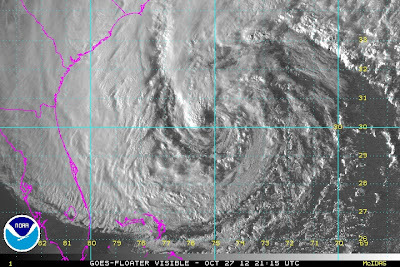 Tropical Storm Sandy around 9pm GMT Saturday night. 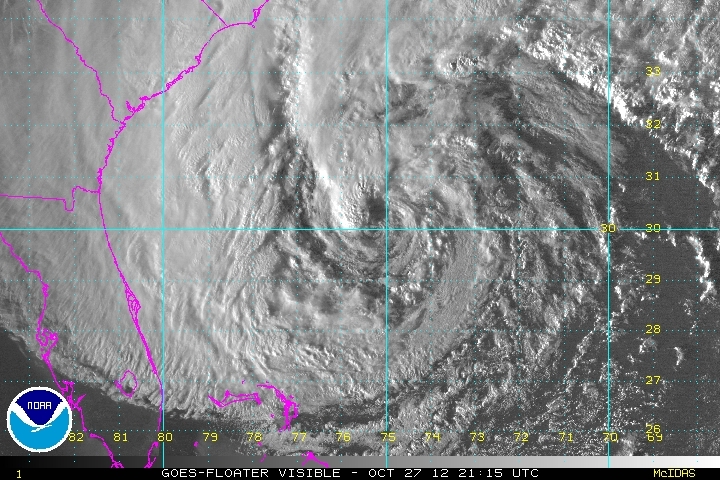 Photo via US National Oceanic and Atmospheric Administration. Yet the access of low-income Americans—those earning less than $20,000 in real 2009 dollars—to devices that are part of the "good life" has increased. The percentage of low-income households with a computer rose to 47.7% from 19.8% in 2001. The percentage of low-income homes with six or more rooms (excluding bathrooms) rose to 30% from 21.9% over the same period. Appliances? The percentage of low-income homes with air-conditioning equipment rose to 83.5% from 65.8%, with dishwashers to 30.8% from 17.6%, with a washing machine to 62.4% from 57.2%, and with a clothes dryer to 56.5% from 44.9%. The percentage of low-income households with microwave ovens grew to 92.4% from 74.9% between 2001 and 2009. Fully 75.5% of low-income Americans now have a cell phone, and over a quarter of those have access to the Internet through their phones. In other words, Chinese Communism has reduced American poverty: with their factories churning out home electronics resulting in glut-pricing, the access of everyone, including the poor, to these goods has increased. Which is as true of poor people anywhere as in the USA -- remember when American politicians would take helicopter flights over Baghdad and proclaim that Iraq must be doing well because of all the satellite dishes? In any event, having spent the first part of their article complaining about data problems with other studies, you'd think they've approached their own data source with a somewhat questioning perspective. 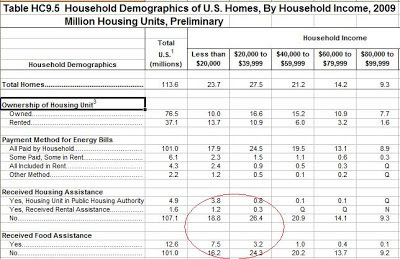 The above is an important table from their source database (US Department of Energy Residential Energy Consumption Survey). According to it, most households with total income below US$40,000 a year are not receiving any assistance with food or housing -- for example, of the households with income below US$20,000 a year, 2/3 are not getting food assistance ("food stamps") and 80 percent are not getting housing assistance. 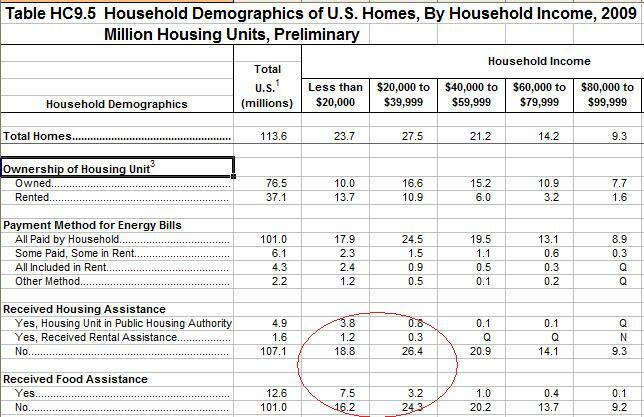 But a big chunk of the low income group has at least 6 rooms in their homes. Note to Washington DC think-tank economists: US$20,000 per year is not a whole lot of money. In short, something ain't right with this data. There are households in the measured low income groups that don't have the typical profile for being poor, which likely means that they are not. One possibility is that it's picking up people immediately post-college and retirees, who will have low measured income but assets. But actual poor people living the high life as they nuke a packet of ramen noodles? Probably good enough for a President Romney to proclaim that they are doing just fine. Angola Fund Set to Invest Oil Revenue in Businesses ... The Angolan fund, which will focus on investments in Africa’s booming hotel industry and large infrastructure projects, seeks to wean the economy from oil, a finite resource, to a more diversified and sustainable base, said José Filomeno de Sousa dos Santos, a son of President José Eduardo dos Santos, and a member of the fund’s board ... The fund’s elegant offices, a few floors down from the oil industry services company Halliburton, are decorated with raw silk wallpaper, designer furniture and black lacquer fittings. So the oil money will be managed by the President's son from the same building that Halliburton is in. Ireland has a reunification model? The Irish Times had a more sober story linked to the same visit, which referred to the topic as a cross-border peace model. North Korea in 1985 halted change in several documents and its propaganda, helping to facilitate meetings in the late 1980s that ultimately produced an inter-Korean pact in 1992 known as the Basic Agreement. It placed inter-Korean dealings within a "special interim relationship stemming from the process toward unification" rather than as sovereign nations. Most elements from that deal have been abandoned, though officials from the two Koreas occasionally call for its revival. It's the Korean Anglo-Irish Agreement. Aabar's disposal of its stake in Daimler early this month was triggered by a failed derivatives deal underpinning the Abu Dhabi investment firm's purchase of the shares, sources familiar with the matter said ... The story of Aabar's Daimler stake underlines how some Middle Eastern investment firms entered derivative deals to finance acquisitions during the region's asset market boom several years ago, only to find the transactions mostly benefited the investment banks involved ... Aabar, also an investor in major corporations such as commodities group Glencore and Italian bank UniCredit, bought 96.4 million Daimler shares, or 9 percent of the company, at 20.27 euros per share in March 2009. It entered derivative transactions, mainly collar trades and put options, to finance the acquisition. The derivatives were sold by Goldman Sachs, the sources said. Allow me to mention, in particular, the work carried out by the Financial Stability Board – the organisation over which I had the honour of presiding between 2006 and 2011 – on the regulation of the financial markets. Mitt Romney names all 15 Arab-Americans who support him. They're the ones who managed to overcome being told that their culture is deficient, that the Palestinian problem is a waste of time, and that US policy in the Middle East should be whatever Bibi Netanyahu wants at that particular time. Today's Nobel Peace Prize award to the European Union is final proof of the descent of the European elites into a self-regarding delirium. Because the one thing the EU project hasn't lacked is self-esteem, and the awarding of prizes to each other. 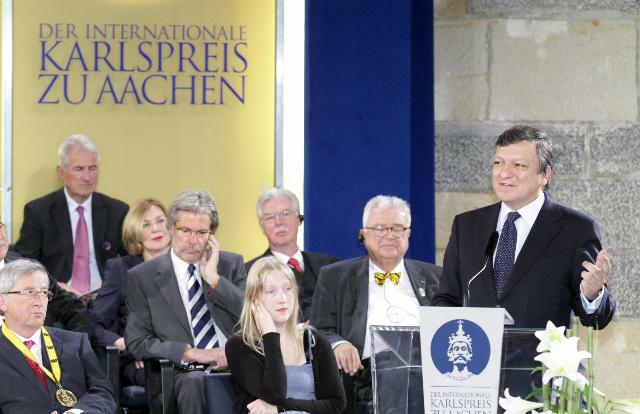 Here's European Commission President Jose Manuel Barroso giving the Charlemagne award to someone, but who awards what to whom is beside the point when you're at this level of pomposity. I'm so old that I can remember when Private Eye awarded the Bore of the Year award for 2 straight years to the Exchange Rate Mechanism of the European Monetary System. That joke isn't funny any more. The Foreign Ministry has urged citizens not to travel to Libya for hunting purposes due to the unstable security situation there. Director of the Department of Citizens Affairs at the Foreign Ministry Issa Abdullah Al Kalbani said that the measure has been taken as part of the government's keenness to guarantee the safety of its citizens. There's a trend of going from the Gulf to Libya for hunting? UPDATE 30 March 2013: The identical warning is issued for Iraq. The United Kingdom abstained from the decision. The decision would have gone through regardless of how the UK voted, and it's technically on the hook for some of the money being lent to Portugal. Kanye West - Touch The Sky from Chris Milk on Vimeo. IMF Managing Director Christine Lagarde and European Central Bank President Mario Draghi at the Eurozone finance ministers' meeting today in Luxembourg. Photo: Council of the European Union. Barack Obama's conservative critics have a remarkable ability to go straight from the obligatory ridicule of America "leading from behind" in Libya to anecdotes like the above. The flaw is in not going the next step and asking whether there is a link between the fact that the USA didn't invade Libya and held back its weapons after the initial NATO attack with the still high esteem in which the USA is clearly held among ordinary Libyans. It just doesn't fit the narrative. What was interesting about Ed Miliband’s speech is there was just nothing about what needs to be done. You know, lots of attacks on wealth creation, but no ideas about how to create it. Lots of attacks on business, but nothing to stimulate it. Lots of talk about what was wrong in the economy, but not a word about the deficit. I thought it was rather an empty vessel, signalling right, but actually turning left. Mr. [Barry] Field : Does my right hon. Friend welcome the publication of the highway code today ? Will he ensure that copies are made available to Opposition Members, some of whom seem to be stuck on a roundabout, uncertain as to which exit to take, while others seem intent on overtaking their leaders on the inside, while we on the Government side look forward to a major road ahead ? The Prime Minister : I should like, if I may, to try to respond to that testing question. I very much welcome the publication of the new highway code. I am bound to say that it does seem to me extremely important that the Leader of the Opposition [John Smith] perhaps should study it. He might learn, after his proposals this morning, that he should not signal right when he is turning left. Tomorrow, Real Madrid will play Barcelona and Inter Milan will play AC Milan. In the USA, the TV rights to both matches are owned by Al Jazeera Sports, operating as BeIN Sport USA. The channel is essentially a dish-only outfit, despite various promises of cable distribution. Cost appears not to be an issue: the channel would like to be more available. It just isn't happening. It looks like skills in unofficial Internet viewing will have to be revived. Qatar made me do it. We are in Slovenia, at the spot where George W. Bush had his first ever summit with Vladimir Putin, after which Bush said he looked into Putin’s eyes and could see his soul and knew this was a man he could do business with. I was wondering if there was any such moment today between you and Mr Weidmann [Bundesbank president]? Draghi: I would like to know from you who is Putin and who is George W. Bush? Question: I leave that to you.